International Journal of Research in Health Sciences,2014,2,4,1201-1208. 1-Postgraduate Program, Medical Faculty, Public Health Study Program, Hasanuddin University, INDONESIA. 2-Hospital Management Department, Faculty of Public Health, Hasanuddin University, INDONESIA. 3-Nutrition Department, Public Health Faculty, Hasanuddin University, INDONESIA. 4-Psychiatric Department, Medical Faculty, Hasanuddin University, INDONESIA. Implementation of ISO integrated in health care at the General Hospital of South Sulawesi province Haji indicate financial performance increased significantly but the public satisfaction index fluctuated in the past three years, as well as the usability of the staff (s) only 0.3 points, far below the standard. The aim of this study compare the productivity performance of the employees who provide health care to the spiritual role of the ISO model, integrated health services without the role of the ISO model integrates spirituality and to assess the relationship of spiritual interventions on employee productivity and assess differences in cortical values employees who provide health care to the spiritual role of the ISO model and integrated health services without the spiritual role of the ISO model integrated. This study applied a quasi experimental with the pre and post test design. Unit of analysis is the KP 20 and 20 KK, the research instrument was a questionnaire and cortical values, two phase measurements for 1 month. Results showed a positive and significant correlation P (Sig <0.05) between the altruistic and productivity, there is a positive and significant correlation P (Sig <0.05) between the meaning of life and productivity, there is a positive and significant correlation P (Sig <0.05) between positive emotions and productivity, there is a negative correlation P (Sig> 0.05) between cortical and productivity, there are differences in labor productivity before and after treatment by calculating X2 > X2 table. To sum up, the role of a spiritual approach is a positive role in improving the productivity of workers, there is a positive and significant correlation between altruistic, meaning of life, positive emotions toward work productivity workers. The lower the value the higher the cortical respondents performance. 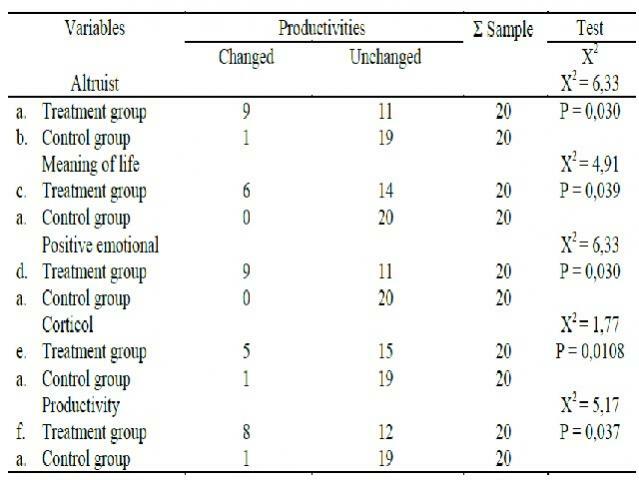 There are differences in labor productivity before and after treatment. Suggestion: Make spiritual activities as an effort to build an Islamic cultural quality for other interested researchers can continue to test Solomon Test.